This person's surname is Bordalo Pinheiro, not Pinheiro. Rafael Bordalo Pinheiro (date unknown). Rafael Bordalo Pinheiro (21 March 1846 – 23 January 1905) was a Portuguese artist known for his illustration, caricatures, sculpture, and ceramics designs. 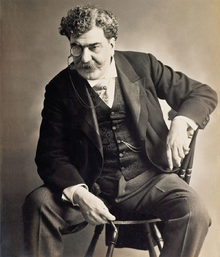 Bordalo Pinheiro created the popular cartoon character Zé Povinho (1875) and is considered the first Portuguese comics creator. Rafael Bordalo Pinheiro was a disciple of his father, the painter Manuel Maria Bordalo Pinheiro. His mother was D. Maria Augusta do Ó Carvalho Prostes and his brother the painter Columbano. He started publishing illustrations and caricatures in humoristic magazines such as A Berlinda and O Calcanhar de Aquiles, frequently demonstrating a sarcastic humour with a political or social message. In 1875, he travelled to Brazil to work as an illustrator and cartoonist for the publication Mosquito (and later, another publication called O Besouro), which was also employing the Italian/Brazilian illustrator Angelo Agostini, until then the unrivaled cartooning authority of Brazil. Pinheiro eventually became editor of other humorous, politically critical magazines. His fame as a caricaturist led the Illustrated London News to become one of his collaborators. He married Elvira Ferreira de Almeida in 1866 and the following year his son Manuel Gustavo Bordalo Pinheiro was born. In 1881, he published the illustrated reportage No Lazareto de Lisboa ("The Lazaretto of Lisbon") that included personal thoughts and anecdotes (not unlike a Joe Sacco or Guy Delisle chronicle), and is considered an early example of autobiographical comics. Rafael Bordalo Pinheiro died on 23 January 1905 in Chiado, Lisbon. He had a Catholic funeral, which was attended by several dozen people, including prominent politicians. In 1875, Bordalo Pinheiro created the cartoon character Zé Povinho (literal translation: "Joe Little People", or "John Doe"), a Portuguese everyman, portrayed as a poor peasant. Zé Povinho became, and still is, as an iconic symbol, the most popular character in Portugal. In Zé Povinho, as in his other works, Bordalo Pinheiro's drawing style was innovative and influential, making extensive use of onomatopoeia, graphical signs (such as those used to represent movement), strong images (the manguito), and his unique style of mixing punctuation marks, such as brackets, with drawing. In 1885, he founded a ceramics factory in Caldas da Rainha, where he created many of the pottery designs for which this city is known. The factory is still in business. Bordalo Pinheiro was devoted to the production of ceramic pieces, which in his hands quickly acquired an original character. The Rafael Bordalo Pinheiro Museum in Lisbon is dedicated to his life and works. ^ Lustosa, Isabel; Britto, Paulo Henriques (1995). "The Art of J. Carlos". The Journal of Decorative and Propaganda Arts. 21: 109–125. doi:10.2307/1504134. JSTOR 1504134. ^ "Biography - Rafael Bordalo Pinheiro". CITI. Retrieved 5 August 2015. This page was last edited on 30 March 2019, at 16:03 (UTC).